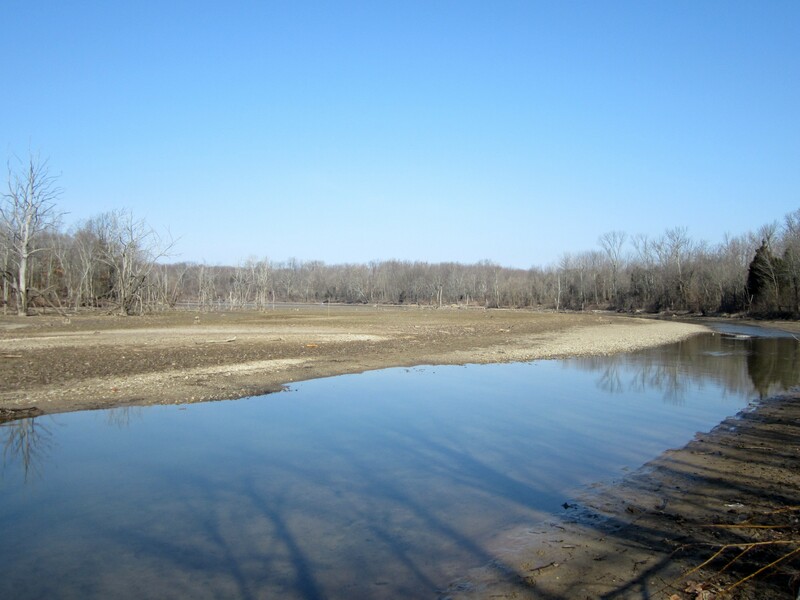 Spring Valley Wildlife Area & Caesar Creek S.P. Do you realize how difficult it was this weekend not to go chasing rarities? First we have a Western Grebe across the Ohio River from Louisville. Then we have a Spotted Redshank, code 4 mind you, at Goose Pond, also in Indiana. Then to top it off a Cinnamon Teal in Lexington. 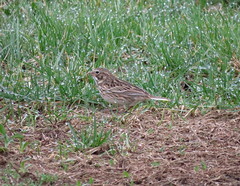 As much fun it is to chase rare and unusual birds, especially if they’re close to home, I’m not particularly upset. Sure it would have been nice to tick off another life bird, but it is Easter weekend and my daughter and husband came home and any time spent with them trumps any bird. This doesn’t mean I didn’t go birding. Saturday bright and early I meet up with Jon at the McDonalds in Waynesville for a little trip to Spring Valley and Caesar Creek. This is one of the nice things about living where I do. These two places are within an easy drive and I can get home in time to visit more with my daughter. The sun was just rising and shedding a little light on what would be a beautiful day, as we made our way down from the parking lot to Spring Valley’s boardwalk. I was hoping for some early Sora activity and I brought my Ipod to entice them into calling. No luck. Spring Valley has so much to offer the birder. 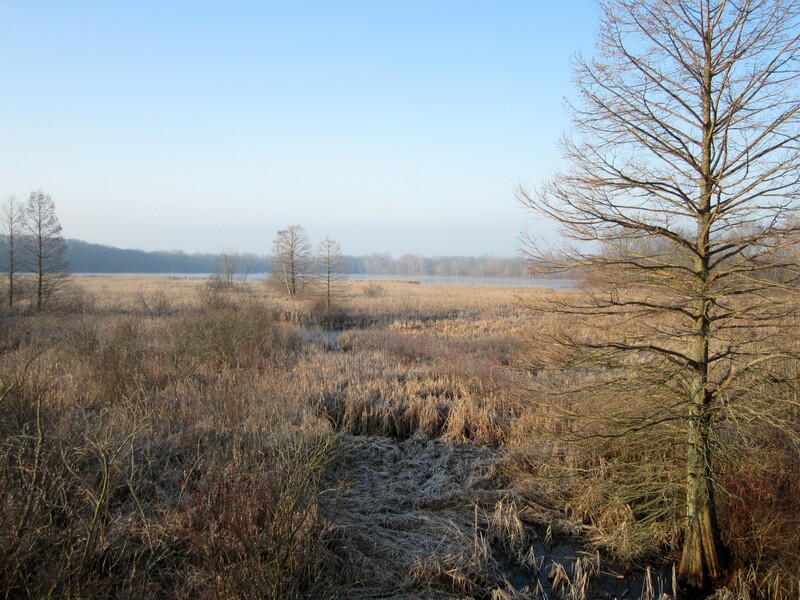 Trails that wind around through the woods, open farmland all around the wildlife area, a nice lake with a marsh that has a trail that circumvents the lake. 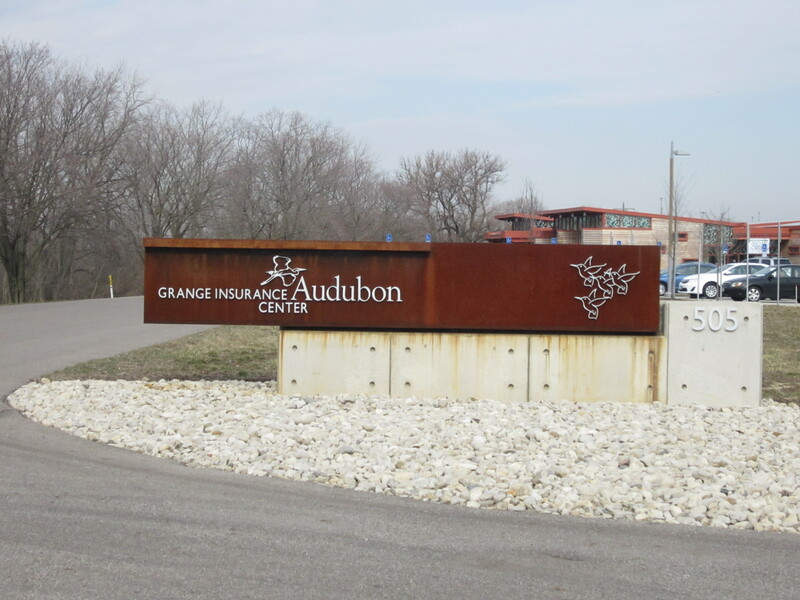 Now wonder that the Ohio Ornithological Society is hosting a field trip here on the 14th of April. Back in December Jon and myself were here we were able to hear and get good views of Marsh Wrens. During the Winter these are kind of rare. And yesterday we heard and saw them again, this time we feel there were more than just a couple. 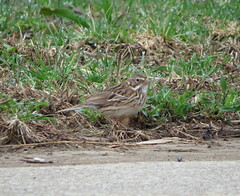 So when I submitted the day list to eBird I had to justify my sighting, but they were there and still a nice bird. We spent a couple of hours here and afterward we headed over to Mounds Road which dead ends at the mudflats at Caesar Creek. Even though it’s early Spring we were hoping that some wading birds might start to show up like Greater and Lesser Yellowlegs. But as luck would have it, especially this year, it was a bust. Not even a Killdeer I’m not sure what it is about Caesar Creek this year, but I usually have some decent birding here during the colder months and early Spring. Just not this year so far. It wouldn’t be a trip here without a visit to Harverysburg Road and see if anything was on the water. The lake was as quiet as I’ve sen in months, which can account for the quietness of the birds on the water. 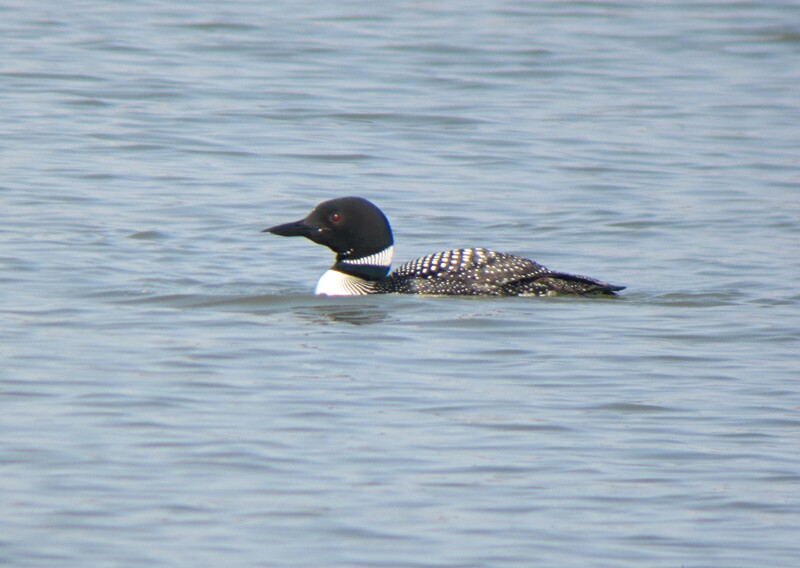 However there was this Common Loon and as you can see it’s in breeding plumage. He was feeding off the end of Harveysburg Road and if you’ve ever tried to get a picture of a Loon while it’s feeding, it can prove to be a difficult task. It seems that they’re on the surface of the water for no more than 10 seconds till they dive again. And when they do come up they could be anywhere. So as a digiscoper I have to get my scope back on the bird, attach the camera and try to focus and get the picture off before it dives again. I have a great picture just as it submerges but I thought you’d rather not see that one. Our last stop was the nature center. They have a mature section of evergreen trees and the hopes were some Pine Warblers. We were able to pick up a couple through their call, but no visual on them. This is one of my favorite spots at the park and as we walked on the trail some of the early Spring Flowers were in bloom. I left my camera in the car so nor pictures. They were small and blue and star shaped. 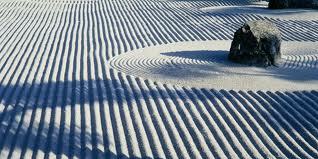 Other than that I’ll let my fellow blogger at “Seasons Flow” tell me what it might be. I could have stayed out all day, it was so nice. Missing out on some rarities just goes with being a bird watcher. There’s always another bird to see. Description: 5″ (13 cm) SPRING MALE Has blackish back and wings, except for broad, white wing panel. Rump is yellow and dark tail has white marginal band towards middle. Blackish nape links to mask above which is white supercilium and blue-gray crown. 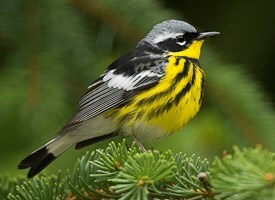 Underparts are mostly bright yellow with black chest band and streaks from chest band to flanks; undertail coverts are white. SPRING FEMALE Similar, but black elements of body plumage are gray or much duller black. 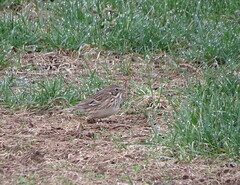 FALL ADULT Recalls spring female, but lacks white supercilium; has two white wing bars. IMMATURE Less colorful than fall adult, unstreaked below. 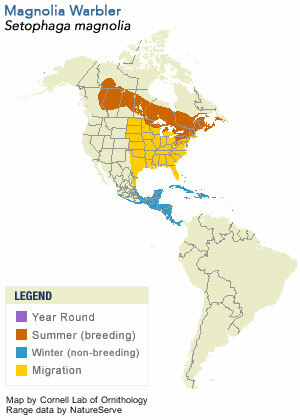 Habitat: Fairly common summer visitor (mainly Jun-Aug) to northern mixed coniferous forests. Winters in Central America. Nesting: A loose cup of grasses on a foundation of twigs, lined with black rootlets. Usually located on a horizontal tree branch near trunk, less than 3 m (10 ft) from the ground. The name of the species was coined in 1810 by Alexander Wilson, who collected a specimen from a magnolia tree in Mississippi. He actually used the English name “Black-and-yellow Warbler” and used “magnolia” for the Latin species name, which became the common name over time. It was a beautiful Spring evening last night in the Ohio Valley. The temperature was in the mid 40’s and the sky was clear of clouds. And as I thought to myself as I was leaving work knowing that I had the next day off, that I should call my buddy Phil and see if he might like to go birding this evening at Gilmore Ponds and look for some American Woodcocks. 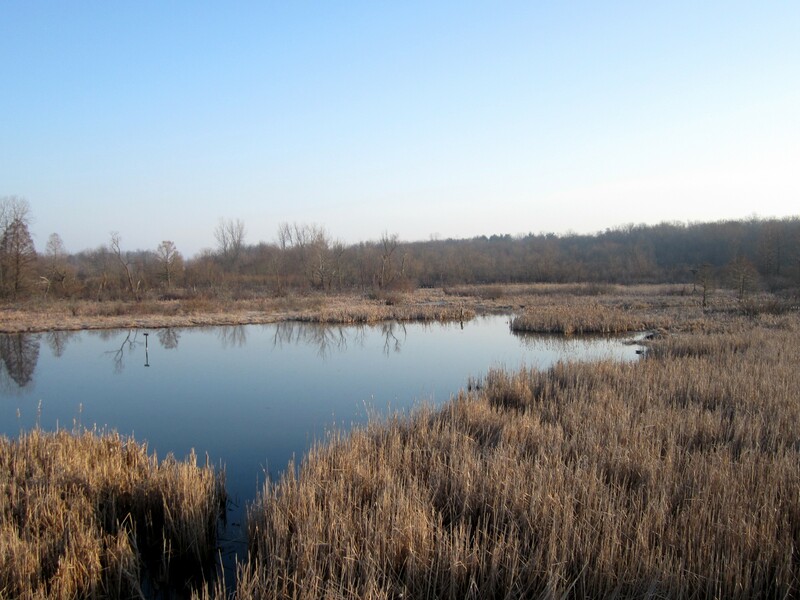 Gilmore Ponds is a 268 acre nature lovers paradise which sits in amongst scores of industrial areas and the suburbs of Hamilton and West Chester. Seasonal flooding makes this a prime location for waterfowl and wading birds especially during the Spring. And as we enter the early part of Spring we start to notice the “Peenting” call of the American Woodcock (Scolopax minor). And the real treat of the American Woodcock is witnessing the aerial display of the male as it flies up in the air as it’s wings create that unmistakable “Tweetering” sound. We arrived a little before 8 pm and set about the task of locating the bird first by it “Peent” call. Phil was the first to hear it just after a freight train passed leaving only the sound of passing cars on Gilmore Road. The trail cut through open meadow on both sides as more Woodcocks n0w called from either side of us. As the darkness deepened a single bird took off and landed on the trail just 20 feet away on the trail. With the naked eye it was just another dark shape, however as we put our bins on the bird there was no denying that it was a Woodcock. We started to walk in the direction of this one observation platform as more and more Woodcocks continued to “Peent”. At the observation platform we scanned the area of water where the Canadian Geese and Mallards were settling in for the night, and another Woodcock called from in front of use and to the right a little. It was dark now and really difficult to see, but then I heard the display sound of wings and looking in the direction of the sound I was able to catch the Woodcock as it displayed in the air. If it wasn’t for the fact that I was looking in the exact spot where it took off I never would have seen it. Darkness was really settling in around us as 8:30 approached. Time to walk back to the car and head home. A second aerial display was seen as the lights from the surrounding area highlighted the bird as it shot up and away creating the unusual “Tweetering” sound with it’s wings as it’s flying. We talked about the total amount of birds either seen or heard this evening as we walked back. Wanting to be more on the conservative side we conclude 5-6 birds. This night was the most activity I had seen of American Woodcocks in a long time and was well worth the trip, even though it’s only about a 30 minute drive. A trip list of birds aren’t necessary at this point since we found what we came for. Total success. Dedicated to birder, as we start our week. 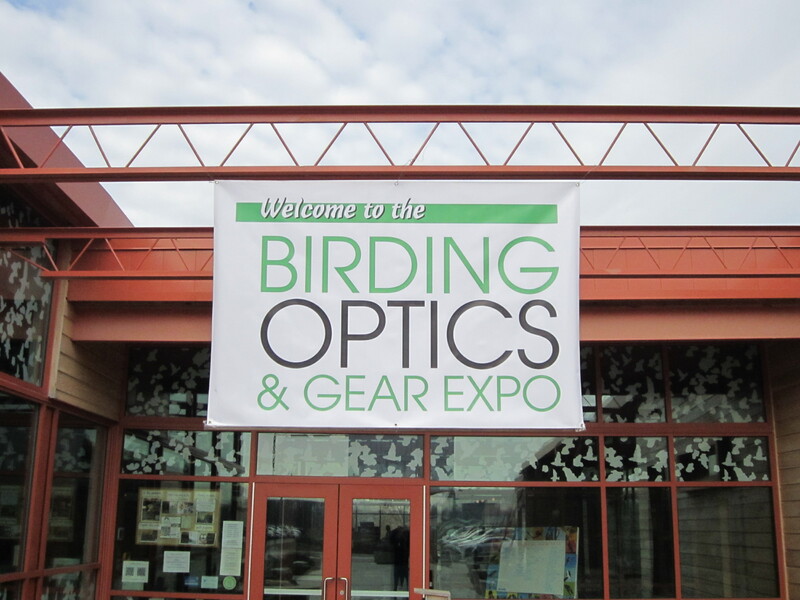 The inaugural “Birding Optics and Gear Expo” is being held this weekend in Columbus Ohio at the Grange Insurance Audubon Center. So when I heard about this I naturally registered despite being a free event. By registering you were eligible for free giveaways, which never hurts. 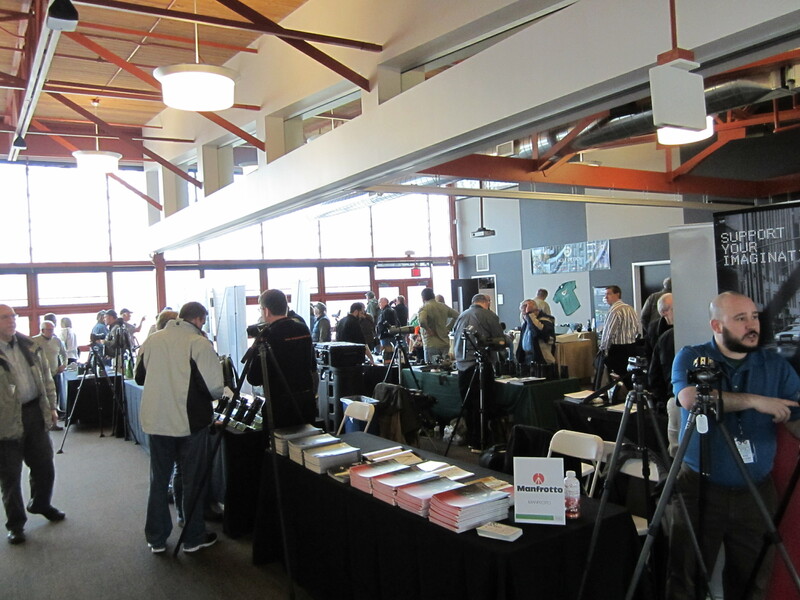 Also according to their web site Vortex Optics was going to be represented at the expo. And since I’m a big fan I thought it would be fun to talk with them. I’m not in the market for any new optics but being able to compare what I’m presently using with the competition will be something I’ve never done before. After leaving the house and filling up the bird-mobile I was on my way by 9:05 for what I thought would be a 90 minute drive up to Columbus. 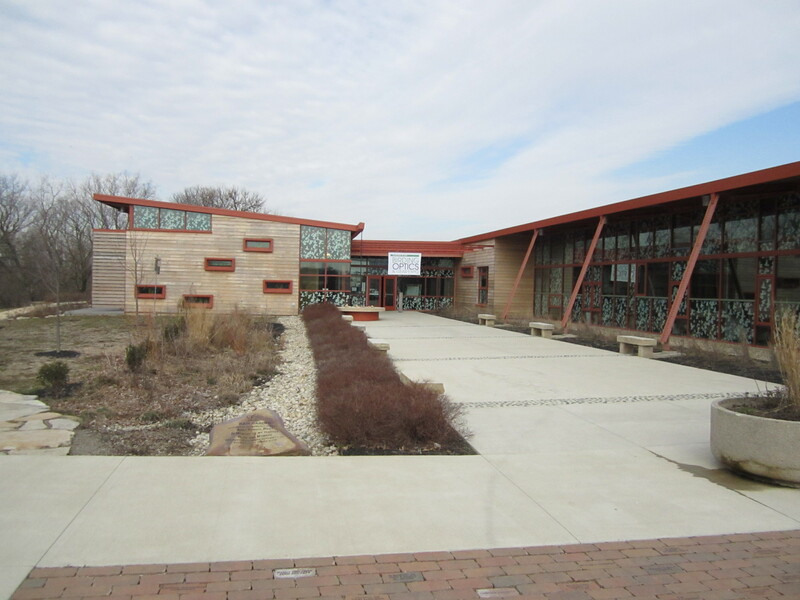 Located in the bend of the Scioto River the Audubon Center is one beautiful building with such a great location. If only Cincinnati had something as nice as this. What impressed me the most about the actual building was how environmentally friendly it is. How rain water is captured and funneled under the sidewalk into a small wetland area next to the building. Even the bathrooms are constructed to conserve water along the same lines as Fernald Preserve. And the inside was equally nice with a gift shop and plenty of places to sit and enjoy the outdoors, with loads of bird feeders with easy viewing. And the library was particularly nice with a large window overlooking the city with feeders set up and rigged with a microphone so you can hear the birds on the inside through a speaker. And with everyone looking at all the new toys the room was very peaceful. Well all the big companies were here. Swarovski, Leica, Zeiss, Kowa, Celestron, Manfrotto, Gitzo, but no Vortex. Eagle Optics which a dealer in everything optical was there selling Vortex products, but no one from the company. The Swarovski booth that I visited once. I wanted to check out a pair of a comparable 10×42 bins, like my own. Very nice, however my Vortex pair I think can compare optically, not price. The same could be said about their spotting scopes if I could get close enough to look through any. They just came out with a new line and they had it set up near the back window. A good many people wanted to take a look through it. 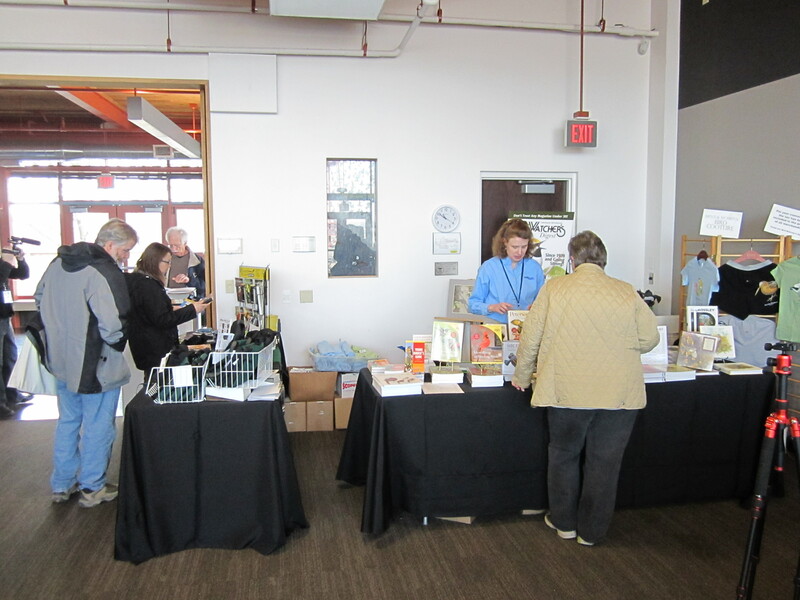 Bird Watchers Digest was there with a booth and Bill Thompson was there as well signing any of his books that were sold. He’s taller than I imagined. As you can see by this photo this was the extent of the expo. The window along the back wall was lined up with spotting scopes of different size and brands. This was a great opportunity for anyone who might be confused as to what to purchase. Here you can look through a Vortex, then step to the next one and it might be a Leica. That’s what I enjoyed about the show the most. Also the free literature and sales brochures from all the companies. I’m not sure what the future is for this expo for next year. I hope it succeeds and continues at this great location. I’m proud of myself that I didn’t spend one thin dime, even though I was ready if I found any kind of pack where one could carry your spotting scope and tripod on your back much like a backpack without all the bells and whistles. 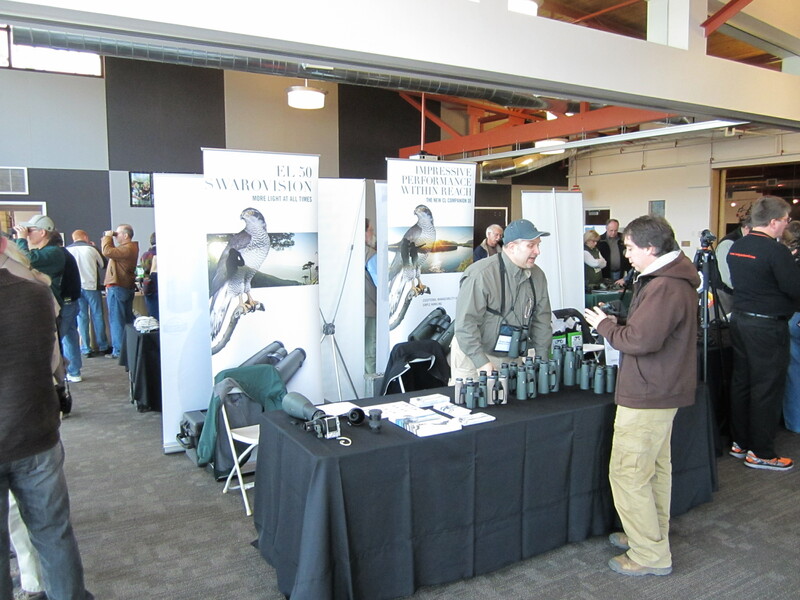 Overall it was a good time and I would recommend it to anyone who might be undecided as to what kind of binoculars or spotting scope they want to buy. Let’s have a show of hands now. 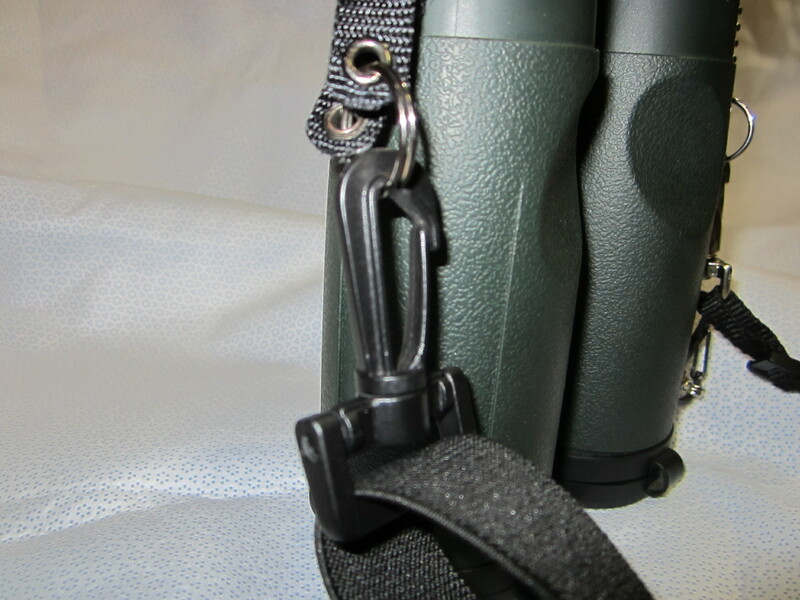 How do you carry your binoculars? A couple of years ago I changed over from using a neck strap to a harness . The reason for the change was neck fatigue from the weight of my bins, and when using a neck strap my cadence from walking would start making my bins swing from side to side. This was annoying to say the least. So the harness was the natural solution, however there is one drawback when trying to use a harness especially during colder/ rainy weather. When wearing heavier coats, jackets or lined rain jackets it’s difficult to get the harness on without having to readjust the straps. Then when it warms up having to go through the process again of readjusting the straps. And the problem with myself is that my harness is adjusted all the way out, so I have no more room. So I came up with a solution that would combine the best of both worlds. To be able to remove the harness, and then attach the neck strap without having to think about it anymore. As you can see by the above picture how the plastic clip attaches to the already attached slip ring assembly, that then stays connected to my bins. Pretty simple and straight forward. 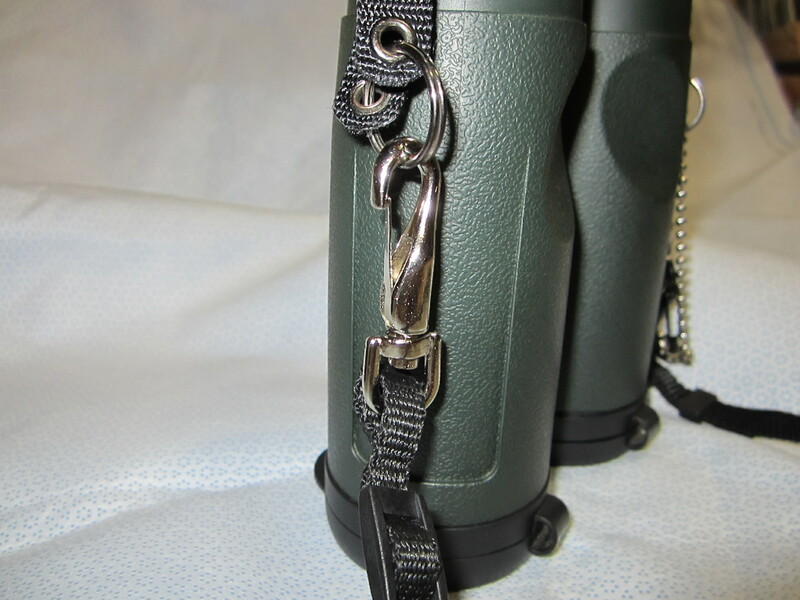 Now with my original neck strap that came with my binoculars I went to my neighborhood Lowes and pick up 2 metal clips and attached them to my neck strap. Now I feel like I have a very versatile way of carrying my bins for whatever type of outerwear I wearing at the time.